Search Results for "cats on green"
Girl patting cat in green park. Long shot of black and white cat in green grass with attractive female person in jacket patting. 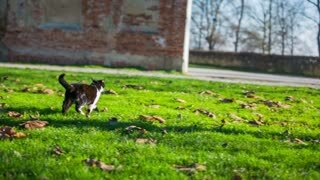 Cat walking over green lawn. Long shot of black and white grown up cat strolling around in green park. Cat in grass watching around. Long shot of black and white cat in green grass looking around for pray. Three little kitties posing. Person puts three baby cats on green lawn and walks away, kitties follow the person. Close-up portrait of a grey cat with big green eyes. The cats runs in search of prey. 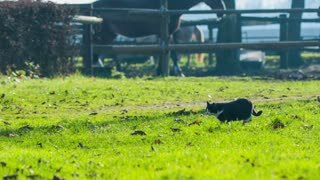 Cat go and jumping in grass. Grey cat playing on the grass. Feral Cat prowling in green grass. White and orange cat with green eyes walking in the ancient abandoned village of Fianello, in the province of Rieti, Italy. FullHD 1920x1080 30fps. Gray British cat eating fresh green grass. Cat grass in a pot is a natural treatment for a hairball. Kittens in cage: siamese cat with blue eyes, furry Turkish Angora cats and persian cats looking with green eyes and playing with a pet toy. 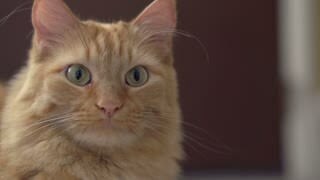 Macro video of cat's green eye. 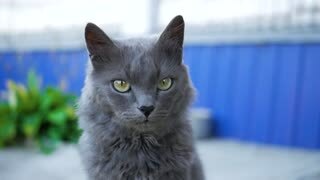 Gray cat looking at the camera. 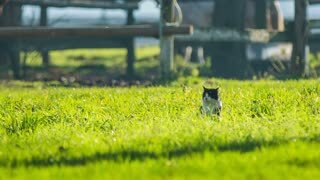 Stray cat walking on green grass in summer city park.